Lawrence Gene David (born July 2, 1947) is an American comedian, writer, actor, director, and television producer. He and Jerry Seinfeld created the television series Seinfeld, of which David was the head writer and executive producer from 1989 to 1997. David has subsequently gained further recognition for the HBO series Curb Your Enthusiasm, which he also created, in which he stars as a semi-fictionalized version of himself. David's work won him a Primetime Emmy Award for Outstanding Comedy Series in 1993. Formerly a stand-up comedian, David went into television comedy, writing and starring in ABC's Fridays, as well as writing briefly for Saturday Night Live. He has won two Primetime Emmy Awards, and was voted by fellow comedians and comedy insiders as the 23rd greatest comedy star ever in a 2004 British poll to select "The Comedian's Comedian". David was born in the neighborhood of Sheepshead Bay, in Brooklyn, New York. His parents are Rose (born Regina Brandes) and Mortimer Julius "Morty" David, a men's clothing manufacturer, and he has an older brother named Ken. David's family is Jewish. His father's side moved from Germany to the U.S. during the 19th century, while David's mother was born in Ternopil, then Austrian Galicia, now in Ukraine. David graduated from Sheepshead Bay High School, and then from the University of Maryland, College Park, where he was a brother in Tau Epsilon Phi in the 1960s, with a bachelor's degree in history. It was while at college that David started developing his take on things and discovered that he could make people laugh, simply by being himself. After college, David enlisted in the United States Army Reserve. While a stand-up comedian, Larry David also worked as a store clerk, limousine driver, and historian. He lived in Manhattan Plaza, a federally subsidized housing complex in the Hell's Kitchen neighborhood of Manhattan, across the hall from Kenny Kramer, the inspiration for the Cosmo Kramer character in Seinfeld. David then became a writer for and cast member of ABC's Fridays from 1980 to 1982, and a writer for NBC's Saturday Night Live (SNL) from 1984 to 1985. During his time at SNL, he was able to get only one sketch on the show, which aired at 12:50 AM, the last time slot on the show. David quit his writing job at SNL in the first season, only to show up to work two days later acting as though nothing had happened. That event inspired a second-season episode of Seinfeld entitled "The Revenge". David met his future Seinfeld stars during that early stage of his career: he worked with Michael Richards (Kramer) on Fridays and with Julia Louis-Dreyfus (Elaine) on SNL. He can be heard heckling Michael McKean when McKean hosted SNL in 1984, and he can be seen in the sketch "The Run, Throw, and Catch Like a Girl Olympics" when Howard Cosell hosted the season finale in 1985. In 1989 David teamed up with comedian Jerry Seinfeld to create a pilot for NBC called The Seinfeld Chronicles, which became the basis for Seinfeld, one of the most successful shows in history, reaching the top of TV Guide's list of the 50 greatest TV shows of all time. Entertainment Weekly ranked it the third-best TV show of all time. David made occasional uncredited appearances on the show, playing such roles as Frank Costanza's cape-wearing lawyer and the voice of George Steinbrenner. He was also the primary inspiration for the show's character George Costanza. David left Seinfeld on friendly terms after the seventh season but returned to write the series finale in 1998, two years later. He also continued to provide the voice for the Steinbrenner character. David wrote 62 of the episodes of Seinfeld, including 1992's "The Contest", for which he won a Primetime Emmy Award and which TV Guide ranked the episode No. 1 on its list of "TV's Top 100 Episodes of All Time". Syndication of Seinfeld earned David an estimated $250 million in 1998 alone. This amount has been steadily decreasing each year, but payments will continue until the full $1.7 billion from the original syndication deal has been paid. In 2008 David made $55 million from Seinfeld syndication, DVD sales, and Curb Your Enthusiasm. He was nominated for an Emmy award 19 times for Seinfeld, winning twice – once for best comedy and once for writing. 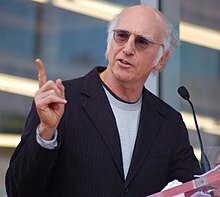 The HBO cable television channel aired David's 1-hour special, Larry David: Curb Your Enthusiasm, on October 17, 1999. This was followed by Curb Your Enthusiasm, a television series on HBO that aired its first episode on October 15, 2000. The show revisits many of the themes of Seinfeld, and is improvised from a story outline only several pages long that David writes (as of the 5th season, additional writers were hired). The actors improvise their dialogue based on the story outline, direction, and their own creativity. David has said that his character in the show, a fictionalized version of himself, is what he would be like in real life if he lacked social awareness and sensitivity. The character's numerous and frequent social faux pas, misunderstandings, and ironic coincidences are the basis of much of the show's comedy and have led to the entry into the American pop culture lexicon of the expression "Larry David moment", meaning an inadvertently created socially awkward situation. The basis of the show is the events in David's life following the fortune he earned from the Seinfeld series; David, semi-retired, strives to live a fulfilled life. Alongside David is his wife Cheryl (played by Cheryl Hines), his manager and best friend Jeff (played by Jeff Garlin), and Jeff's wife Susie (played by Susie Essman). Celebrities, including comedians Bob Einstein, Wanda Sykes, and Richard Lewis, appear on the show regularly. Actors Ted Danson and Mary Steenburgen have had recurring roles as themselves. The show is critically acclaimed and has been nominated for 30 Primetime Emmy Awards, with one win, as well as one Golden Globe win. In the first six seasons, Julia Louis-Dreyfus and Jason Alexander appeared in several episodes, and Jerry Seinfeld made a cameo. In season 7, the cast of Seinfeld, including Michael Richards, returned in a story arc involving David's attempt to organize a Seinfeld reunion special. On Wednesday, June 2, 2010, the series premiered on the TV Guide Network, making its network television debut. TV Guide Network also produced a series of related discussions with high-profile guest stars, media pundits, and prominent social figures called "Curb: The Discussion" debating the moral implications depicted in each episode. David is quoted as saying "Finally, thanks to the TV Guide Network, I'll get a chance to watch actual, intelligent people discuss and debate the issues addressed on 'Curb'. Now if only someone could tell me where this alleged 'Network' is, I might even watch it." David has also been involved in other films and television series. David wrote and directed the 1998 film Sour Grapes, about two cousins who feud over a casino jackpot. It was neither a commercial nor a critical success. He appeared in minor parts in two 1980s Woody Allen films – Radio Days and New York Stories – before taking the leading role in Allen's New York-based comedy film Whatever Works (2009). David had a cameo appearance on the HBO series Entourage as a client of Ari Gold, and because his daughters were Hannah Montana fans, David, along with his daughters, guest-starred, as themselves, in the episode "My Best Friend's Boyfriend," in which they were waiting for a table at a fancy restaurant. During the 2008 U.S Presidential Election, David supported and actively campaigned for Barack Obama. In December 2010 David penned an op-ed piece for The New York Times, a sardonic critique of the extension of Bush-era tax cuts headlined "Thanks for the Tax Cut!" David appeared as a panelist on the NBC series The Marriage Ref and also played Sister Mary-Mengele in the 2012 reboot of The Three Stooges. David co-wrote and starred in the 2013 HBO television film Clear History. David wrote and starred in the Broadway play Fish In The Dark. Also appearing were Rita Wilson, Jayne Houdyshell and Rosie Perez. The play centers on the death of a family patriarch. It opened March 5, 2015. Jason Alexander took over David's role in July. The play closed in August. As of February 1, 2015, its advance sale of $13.5 million had broken records for a Broadway show. In 2015 and 2016, David had multiple guest appearances portraying 2016 U.S. presidential candidate Bernie Sanders on Saturday Night Live; he also hosted the show on February 6, 2016, with musical guest The 1975 and a cameo from Sanders himself. David married Laurie Lennard on March 31, 1993. They have two daughters, Cazzie Laurel (b. May 10, 1994) and Romy March (b. March 2, 1996). David and his wife became contributing bloggers at The Huffington Post in May 2005. Laurie David filed for divorce on July 13, 2007, citing irreconcilable differences and seeking joint custody of the couple's two daughters. A DNA test, conducted as part of the PBS series Finding Your Roots in October 2017, has shown that Larry David and Vermont Senator Bernie Sanders, whom David famously parodied on Saturday Night Live sketches during the presidential primaries of the Democratic Party in 2016, are in fact distant cousins of shared Ashkenazi Jewish ancestry. David is an atheist and has voiced his opinion that religion should be ridiculed. As of 2013, David's estimated net worth was $900 million. However, the estimate according to a former Reuters reporter does not take into account the divorce. David also disputes the figure, saying he has nowhere near that amount. Nominated for an Emmy Award for Outstanding Guest Actor in a Comedy Series for his turn as host in the Saturday Night Live episode "Larry David/The 1975", in 2016. Nominated for an Emmy Award for Outstanding Writing for a Comedy Series for various episodes of Seinfeld from 1991 to 1994. Won an Emmy Award for Outstanding Writing for a Comedy Series for the Seinfeld episode, "The Contest", in 1993. Shared an Emmy Award for Outstanding Comedy Series for Seinfeld with co-creator, Jerry Seinfeld. 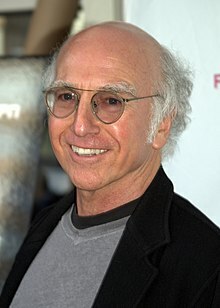 Nominated for a Golden Globe Award for Best Actor in a Television Series – Musical or Comedy for his role in Curb Your Enthusiasm in 2002, 2004, and 2005. Voted by fellow comedians and comedy insiders as number 23 of the greatest comedy stars ever in a poll to select The Comedian's Comedian. Nominated for an Emmy Award for Outstanding Lead Actor in a Comedy Series for his role in Curb Your Enthusiasm in 2003, 2004, 2006, 2010, 2012 and 2018. Laurel Award for TV Writing Achievement from the Writers Guild of America in 2010. 1993 Love & War Himself Episode: "Let's Not Call It Love"
2004 Entourage Himself Episode: "New York"
2007 Hannah Montana Himself Episode: "My Best Friend's Boyfriend"
2011 The Paul Reiser Show Himself Episode: "The Father's Occupation"
2014 TripTank Himself (voice) Episode: "Roy & Ben's Day Off"
2015 The League Future Ruxin Episode: "The Great Night of Shiva"
2016 Maya & Marty Himself Episode: "Jimmy Fallon & Miley Cyrus"
^ a b "Larry David Biography". TVGuide.com. Archived from the original on July 18, 2012. ^ "Larry David". Encyclopædia Britannica. Retrieved 2009-07-14. ^ Steve Heisler (June 2, 2010). "Improv on TV: How Curb Your Enthusiasm Gets It Right". TV.com. CBS Interactive Inc. Archived from the original on February 4, 2013. Retrieved August 24, 2012. ^ a b "The comedians' comedian". Chortle. Retrieved 2009-06-16. ^ Wallace, Benjamin (January 26, 2015). "Why Larry David the Schmuck Was the Best Thing to Happen to Larry David the Mensch". New York Magazine. Retrieved November 1, 2017. ^ "Larry David Spotted on Campus". The Baltimore Sun. Retrieved April 4, 2013. ^ "Some of Maryland's Distinguished Alumni". University of Maryland. Archived from the original on March 31, 2013. Retrieved April 4, 2013. ^ David, Larry (2004-02-15). "My War". The New York Times. Retrieved 2011-08-22. ^ McShane, Larry. "The real Kramer says actor no racist: But Richards is 'paranoid,' 'very wound-up'", Chicago Sun-Times[dead link], November 26, 2006. Accessed August 11, 2009. "The real Kramer lived for 10 years in a Hell's Kitchen apartment across the hall from Seinfeld co-creator Larry David, and his life became the framework for Richards' quirky, bumbling Seinfeld sidekick." ^ a b Marin, Rick (2000-07-16). "The Great and Wonderful Wizard of Odds". The New York Times. Retrieved 2008-04-25. ^ a b Shales, Tom (2005-11-12). "'SNL in the '80s': The Last Laugh On a Trying Decade". The Washington Post. Retrieved 2008-04-25. ^ Louis-Dreyfus, Julia; Richards, Michael; Alexander, Jason (November 3, 2004). Seinfeld Seasons 1 & 2: Audio Commentary - "The Revenge" (DVD). Sony Pictures Home Entertainment. ^ Horiuchi, Vince (November 22, 2004). "Side-splitting 'Seinfeld' finally arrives on DVD". Salt Lake Tribune. p. C7. ^ Koltnow, Barry (1997-05-30). "Eager Actor Finds Kramer a Bit of a Trial". Contra Costa Times. Retrieved 2008-04-02. ^ Kolbert, Elizabeth (1993-06-03). "Julia Louis-Dreyfus: She Who Gives 'Seinfeld' Estrogen". The New York Times. Retrieved 2008-04-02. ^ "Saturday Night Live". TV.com. Archived from the original on 2008-12-27. Retrieved 2008-04-21. ^ Carter, Bill (1997-12-26). "Seinfeld Says It's All Over, And It's No Joke for NBC". The New York Times. Retrieved 2008-04-25. ^ "The 'real' George Costanza sues Seinfeld for $100 million". CNN. 1998-10-26. Archived from the original on June 19, 2008. Retrieved 2008-04-25. ^ Dancis, Bruce (2007-11-05). "DVD Review: 'Seinfeld: Season 9' wraps up all the hilarious nothingness". The Sacramento Bee. Archived from the original on January 16, 2008. Retrieved 2008-04-25. ^ "Still ... seventh-season DVD shines". The Sacramento Bee. 2006-11-21. ^ "Who's the richest? Seinfeld". Associated Press. 1999-01-01. Retrieved 2008-01-19. ^ "#65 Larry David – The 2009 Celebrity 100". Forbes. 2009-03-06. Retrieved 2009-10-05. ^ Academy of Television Arts & Sciences (2012). "Larry David". Emmys.com. Academy of Television Arts & Sciences. Retrieved August 24, 2012. ^ "Larry David". TV.com. Archived from the original on 2008-02-22. Retrieved 2008-04-21. ^ TV.com. "Curb Your Enthusiasm: Larry David: Curb Your Enthusiasm". TV.com. Retrieved 2017-04-19. ^ "Curb Your Enthusiasm". TVGuide.com. Retrieved 2017-04-19. ^ "COMEDY CLUB. (Jerry Seinfeld: a film 'Comedian,' and his influence on the 'Curb Your Enthusiasm' TV show)". The New Yorker. 2002-10-28. Retrieved 2008-04-19. ^ "'Curb Your Enthusiasm' and 'Seinfeld' Writers Talk About the Legend of Larry David". RollingStone. 2011-07-20. Retrieved 2011-07-25. ^ "Larry David Talks Dating Post-Divorce, 'Seinfeld' and Wealth". Rolling Stone. July 20, 2011. Retrieved July 27, 2011. ^ David Brinn (October 8, 2009). "'Yeah, I'm available for Woody Allen'". Jerusalem Post. ^ a b rick mcginnis (2004). "Once Upon A Time In Mexico Columbia Tristar Home Entertainment DVD". Life with Blog: Father. rick mcginnis. Archived from the original on June 14, 2008. Retrieved August 24, 2012. ^ "TV Guide Network Teams-up with Legendary Show Creator Larry David to Launch "Curb Your Enthusiasm" Exclusive Extras Hosted by Series Regular Susie Essman". March 22, 2010. Retrieved March 22, 2010. ^ "Sour Grapes". Box Office Mojo. Retrieved 2008-04-02. ^ "Sour Grapes". Rotten Tomatoes. Retrieved 2008-04-02. ^ Sperling, Nicole (2008-02-06). "Larry David, Evan Rachel Wood to star in Woody Allen's next movie". Entertainment Weekly. Archived from the original on 2008-02-15. Retrieved 2008-04-02. ^ "Larry David, Evan Rachel Wood to star in Woody Allen's next movie". Hollywood Insider. Entertainment Weekly. Archived from the original on 2008-02-18. Retrieved 2008-02-07. ^ "Reuters: Larry David "Praises" Tax Cuts for Rich in NY Times". 2010-12-21. ^ David, Larry (2010-12-20). "Thanks for the Tax Cut!". The New York Times. ^ "Larry David Torments 'The Three Stooges' And 'Hunger Games' Finds More Tributes In Today's Casting Call » MTV Movies Blog". Moviesblog.mtv.com. Retrieved 2011-06-13. ^ "Fish In The Dark". Archived from the original on 2015-01-13. Retrieved 2015-01-13. ^ Zinoman, Jason (January 28, 2015). "Enthusiasm, Entirely Uncurbed: Larry David's 'Fish in the Dark' Comes to Broadway". The New York Times. Retrieved January 28, 2015. ^ a b c "Laurie Ellen David v. Lawrence Gene David Petition for Dissolution of Marriage" (PDF). Los Angeles Superior Court. July 13, 2007. Archived from the original (PDF) on July 3, 2013. Retrieved March 7, 2017 – via TMZ.com. ^ "Laurie David's Huffington Post blogger page". Retrieved 2009-11-24. ^ "Larry David's Huffington Post blogger page". Retrieved 2009-11-24. ^ Finn, Natalie (2007-07-19). "Divorcing Larry David". E!. Archived from the original on 2009-11-13. Retrieved 2008-04-02. ^ Shor, Nissan. Curb Your Judaism: Why Larry David Is a Better Jew than ... www.haaretz.com/opinion/.premium-why-larry-david-is-a-better-jew-than-most-israelis-1.5460727. "Larry David is a Jewish atheist. In a video interview with The New York Times in 2007, he said: "People ... go around as if [God] is a fact. It’s so insane. If I really believed that stuff I’d keep it to myself, unless somebody would think I was out of my mind." Larry presents his Jewishness as a defiance of God, giving him the finger." ^ Horgan, Richard. "Larry David, Jerry Seinfeld: Nothing But Net Worth". Archived from the original on January 1, 2015. Retrieved 2014-08-29.